My clients often complain that even though they tap regularly for their issues, there are times when their emotions get the better of them. The goal of Emotional Freedom Techniques (EFT) is not for us to become emotionless. Our emotions are important because they allow us to feel in order to navigate the world and they are what give our experience richness. The problems isn’t the emotions themselves, but when and how strongly they show up. In this week’s podcast I talk about the ultimate goal of tapping AND how we can best understand our experience of our emotions. I would love to hear what you think the main goal of tapping is in the comments below. What a great way to separate ourselves from the situation and take a moment to ponder. I appreciate the direction and specifics you use to explain this principle. 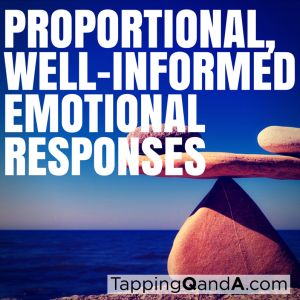 Even though the basic idea of “Proportional Well Informed Emotions” appeals a lot to me, I have difficulties actually using these concepts. Is it “well informes” and “proportionat” if my rational mind thinks so?`I find there is a part of me that distrusts – that fears that such concepts may be just another form of rationalisation, a more officially sanctuated form of downplaying painful experience. I understand rationally that this is not what it is about, but I have a hard time convicing that other distrusting part. That is the place where tapping comes in. I have found that I can’t reason with the emotional part (because it is emotional), but when I tap with it that is when it starts to shift.